Thirty-seven years old and a registered nurse, David is the father of two girls Kimberly (age 5) and Danielle (age 7). Having lost his wife a year ago to a major illness David has assumed the entire responsibility of the family’s finances. The only savings he has struggled to keep up with is a monthly sou sou of $1,800 with friends at work. The group started saving since January and David is expected to collect his “hand” (payout) in July of this year. David’s plan is simple – take the money and book a trip to Disneyland, California for the summer holidays. This is something he and Debra had always dreamed of doing with the girls but with the recent emotional upheaval he thinks this trip would do the family some good. David also has a new situation to deal with; his twenty cubic foot refrigerator started leaking and he called in appliance repairman Joe. Joe fixed the problem but advised it would probably recur and that David would be lucky if he got two years service from the unit. This is not good news especially in light of his car showing signs of ageing and is frequently at the mechanic shop. No one would fault David for making the trip, “life indeed is too short” – his wife is proof of that. But David has to choose between the promise of creating happy childhood memories for the girls and dealing with two potentially big-ticket expenses. A trip to Disneyland for three, over ten days could cost David upwards of $20,000. If he used the sou sou money, which is $21,600 ($1,800 x 12) he might be left with $1,600. The sou sou would then convert from being a savings plan into be a (zero interest) loan of $9,000 ($1,800 x 5 months) until the end of the year. Indeed $1,600 could give him a small start towards his other major goals but if per chance Joe’s prediction were to happen sooner rather than later, how would David respond? The quickest fix would be to approach a hire purchase company where a new fridge of that size could cost about $10,000, and with no down payment as Trudy alluded to and interest rates at least 36% per annum, over three years, David’s monthly payment would be about $459, with a total payback of $16,500. If instead he were to pay the cash price then this extra $6,500 in interest could have gone towards another goal. What if his car had a major breakdown? A transmission for example could cost several thousand dollars to repair or replace. How would he pay for this? Should he continue to pump good money behind an old vehicle? What about the stress, inconvenience and time off from work? Would he be better off making a plan to purchase a newer vehicle before the situation gets worse? He could use money from the sale of the current vehicle as a down payment to reduce his debt load. How would the sou sou (turned debt) and the potential hire purchase payments affect his monthly cash flow and his ability to afford a new car payment? The unpredictability of life is something that every good financial plan should cater for. [Emergency Definition: An unexpected situation that poses and an immediate risk to health, life or property requiring urgent intervention to prevent a worsening of the situation. – Wikipedia Adapted]. Emergencies fall into two major categories: the more frequent ones that occur months at a time and could cost a few hundred dollars and the less frequent ones that may take years but can cost thousands or tens of thousands of dollars. 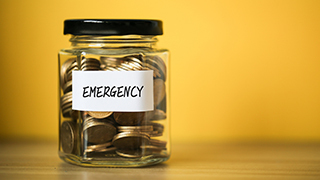 The recommended size for an emergency fund is three to six times of monthly income. Assuming David’s current monthly savings were 20% of his salary then he should set aside at least $27,000 ($1,800 / 20% = $9,000 x 3 months) for this purpose. Before David makes an impulsive decision maybe he should seriously consider holding on to the sou sou money as part of his emergency reserve. This story could have a happy ending in that David could put his priorities in order starting with emergency funds, a new fridge, a new car and then the vacation. Using his monthly savings to knock off each of these goals in sequence, improving his ability to deal with life’s challenges, avoid unnecessary high cost debt and retain more of his earnings to build future wealth.